Whether you have kids or not, Gingerbread Pancakes are fun on Christmas morning. 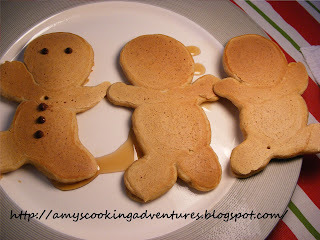 Pancakes are always a big hit in my house and the gingerbread spices make these a fun holiday treat! And of course, these taste even better if made into little gingerbread men with chocolate chip buttons! Whisk together the all purpose flour, whole wheat flour, wheat germ, flaxseed, baking powder, salt, and spices in a large bowl. In a separate bowl, whisk together the eggs, milk, vanilla, and molasses until well blended. Pour the liquid ingredients over the dry ingredients until just combined. Heat a large non stick skillet to medium-high heat. Pour the batter onto the hot skillet, using a ¼ cup measuring cup if desired. Cook until bubbles begin to appear on the surface of the pancakes and the bottoms turn golden, about 3 minutes. Flip and cook until golden, an additional 2-3 minutes. If desired, top with mini chocolate chips. Serve with powdered sugar or your favorite syrup. 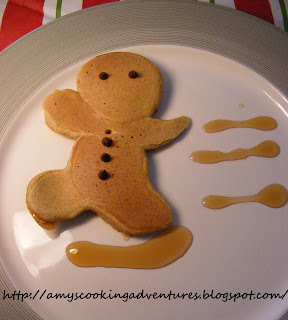 Yum, I love the idea of gingerbread pancakes on Christmas morning!